The propulsion engine of your boat or vehicles may be used to quickly charge your service batteries, either while cruising or taking a break. The advanced and powerful Alpha Pro III ensures fast and safe charging, protecting both the engine and the batteries. Building on 10 years of experience, the Alpha Pro III features a modernized look, higher power and improved ease of use. The Alpha Pro III measures the temperature and the voltage of your batteries to prevent overcharging, keeping them in perfect condition. It also monitors the engine load, thus reducing sound variations, wear and tear. The smart ‘keep alive’ feature solves a common problem causing unreliable tachometer readings. 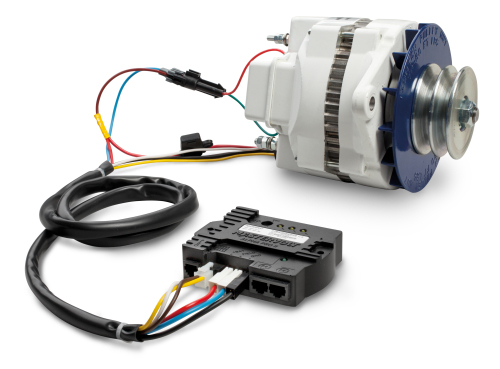 Via MasterBus, it communicates RPM, alternator status and charge status to create intelligent power systems. The alternator that comes with the engine is not optimally suited for charging service batteries. Designed for low cost and short charge cycles, it charges at a slow pace and is easily overheated. Replacing the standard regulator* with the Alpha Pro III optimizes this charging process, protects against overheating and overcharging and extends the lifetime of your batteries. 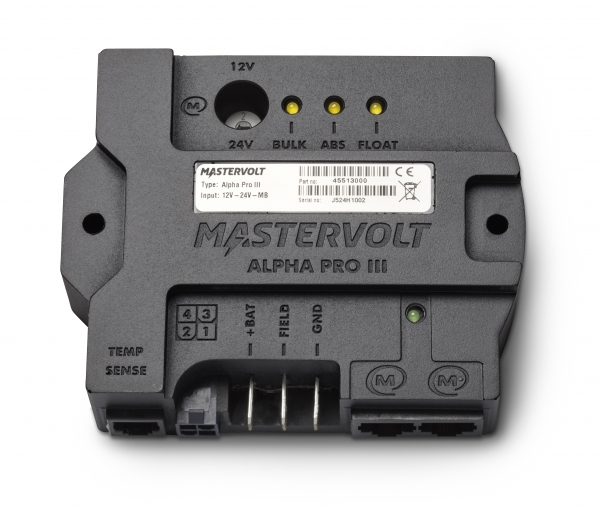 For superfast charging at low RPM, Mastervolt recommends to combine the Alpha Pro III with a high performance alternator such as the reputable Alpha series. 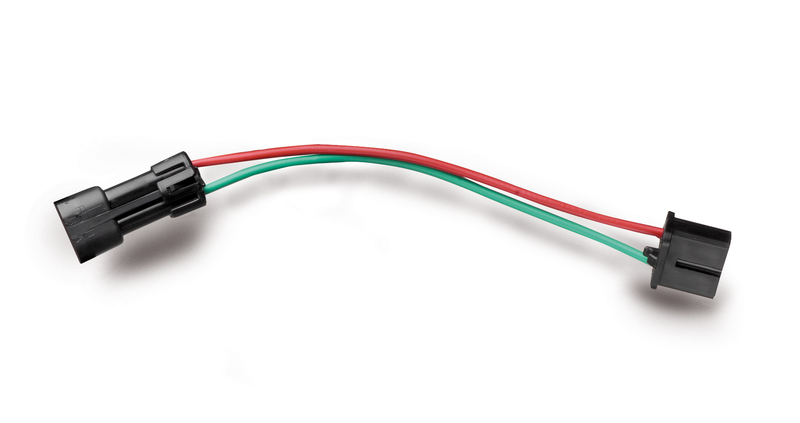 With 20 amps of field current capability, the Alpha Pro is the only 3-step regulator in the market capable of controlling alternators with outputs up to 400 A! Alpha Pro III: Fast charging, anytime, anywhere. Transforms every alternator into a full temperature controlled 3-step charger. Reduces run time, saves fuel, reduces noise and emissions. Protects from overcharging and extends battery life. Balances engine load, reducing RPM variations. 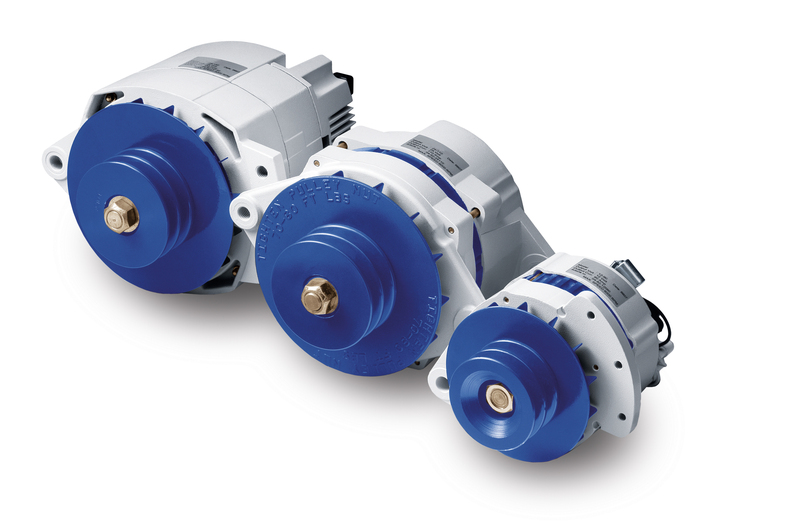 Compatible with standard and high performance alternators, incl. 200 A ~ 400 A models. Integrated ‘keep alive’ feature for reliable tachometer readings. Suitable for every battery type, including Lithium Ion. Suitable for 12 V and 24 V system voltages. 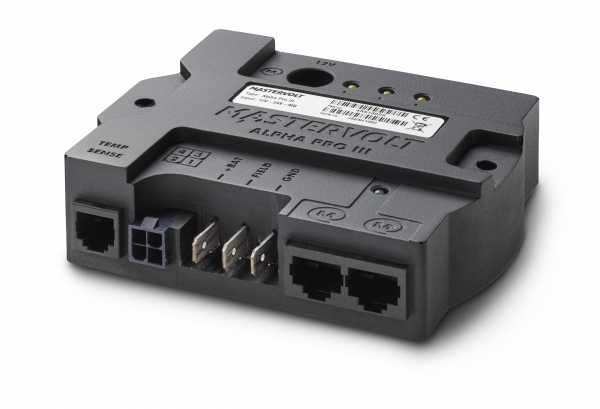 Masterbus compatible: simplifies wiring, saves space and weight, and creates optimal cooperation between Mastervolt products. Applications range from improving the performance of a standard alternator in a vehicle or boat, to generator replacement, when combined with a high performance alternator. Abby Ehler from Team Brunel shares her experience with the Mastervolt Power System in the Volvo Ocean Race, especially when it comes to ease of operation. Liz Wardley, boat captain of Team Turn the Tide on Plastic, really likes the reliability of the Mastervolt Lithium Ion batteries onboard the VO65. Simon Fisher, navigator of Vestas 11th Hour Racing, elaborates on the importance of the flawless integration of Mastervolt and B&G.